Homemade Healthier Mounds Bars. Who doesn’t love a Mounds bar? Chocolate on the outside, coconut on the inside. Yum yum! Well, I am betting the store bought Mounds Bars have a lot of ingredients I try to avoid. 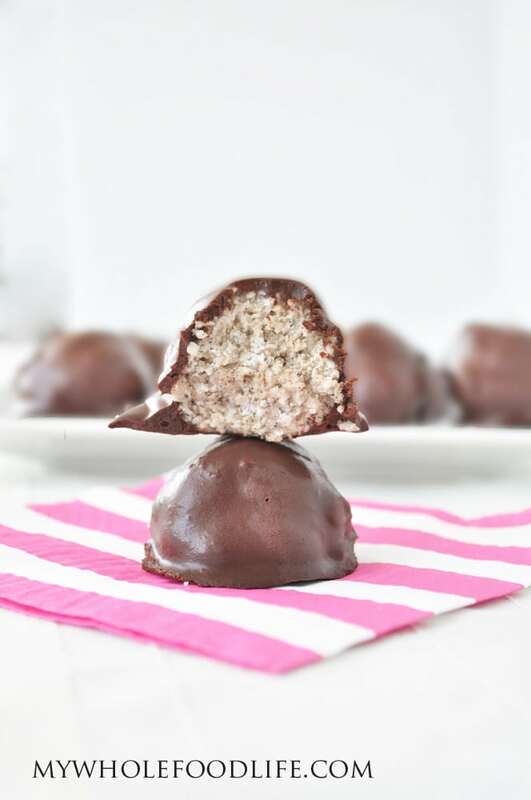 My homemade, healthier Mounds bar recipe only calls for 6 ingredients and is very easy to make. If you like this recipe, you may also enjoy my Copycat Peanut Butter Eggs or my Almond Joy Energy Bites. Looking for more homemade candy recipes? A healthier version of the store bought treat! In a food processor , combine all the filling ingredients for 1-2 minutes. Form into balls and place on a lined baking sheet. The mixture will seem loose, but I promise it stays together once it's set. Place the baking sheet in the freezer. Let it sit in there for an hour to get the balls nice and cold. Using a double boiler method, melt the chocolate and the milk together. Stir constantly until the chocolate is smooth. Carefully, using two forks, roll the balls into the chocolate and set them back onto the baking sheet. Place them back in the freezer to set. It should take about an hour. Once the chocolate has set, you can store these balls in the fridge or keep them in the freezer. If you choose to store these in the freezer, you will need to let them sit outside the freezer for a couple of minutes before you eat them. Enjoy! These look amazing! I love your blog and your recipes so much. Keep up the great work! This is sooo good. I only had 1 cup coconut so I added a 1/2 cup almonds. Still delicious!! I am so in love with all your recipes!! I made these with SoyCurls (high protein) instead of coconut, coconut extract instead of vanilla & dark chocolate. I'm vegan & Type 1 diabetic so I'm always looking for a great base recipe. These taste awesome. Thank you. Something went horribly wrong with the chocolate! Was on the way to melting nicely when it suddenly congealed into the most disgusting gloppy mess instantly. No way was it dippable, or even smoothable... Was it the almond milk that caused this? Never had chocolate do this before. These were a little more time consuming because I had no food processor and had to use a blender for mixing, but well worth the time! So delicious! I doubled the batch because I know they will get eaten. Hopefully they last long enough for others to try them! Also, I used cold chocolate with the cold milk and dipping was very easy. I am glad you liked them and were also able to make them without a food processor. Great recipe! My little ones enjoyed this special treat.